Permanent Account Number or PAN Card is considered as the identity proof an important document in India. 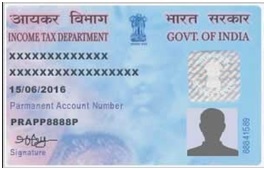 PAN card is required to file income tax returns, to open a bank account and to make payments that are above 50,000. PAN card can be issued to citizens of India, non-resident Indians (NIRs) and even foreign citizens but the procedure for application is different for all the categories. One can easily apply for pan card via a process that is completely online. So, if you are an Indian and wondering how to apply for PAN card, then wonder no more. 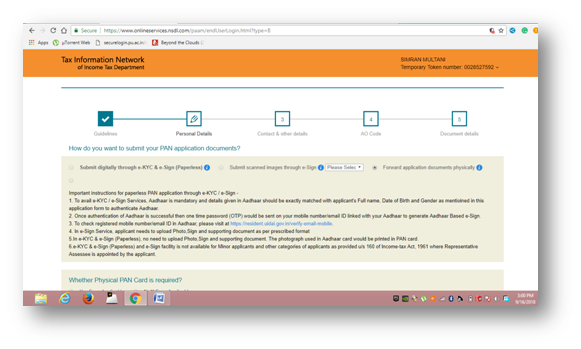 We have a complete guide for you on how to apply for PAN Card Online. • The applicant must be a citizen of India having all the required documents to apply for PAN card i.e. Address proof, Identity proof and Date of Birth proof. • If you are an Indian but residing in some other country, then you can provide a copy of Bank statement in your present country as a proof of your address. • If the applicant is minor (below the age of 18), then his/her parents can apply for PAN card on their behalf. • If the applicant is mentally challenged, then a representative can apply on his/her behalf. But both the mentally challenged individual, as well as the representative, need to provide their documents and details. • In case if you are running a company and you need a PAN card for your company, then your company must be registered with the Registrar of companies. You need to provide the registration certificate in order to get PAN card for your company. • In case of partnership firms or limited liability partnerships, the firms must be registered with the relevant government authorities and they too need to provide the registration certificate in order to apply for PAN card. Eligible Age limit to apply for PAN card: The minimum age limit to apply for PAN card is 18 years. In case if the applicant is younger than 18 years then, his or her parents can apply for PAN card on their behalf. There is no maximum age limit to apply for PAN card; you can apply for it at any age above 18 years. All Indian citizens require three main documents to apply for PAN card: Identity proof, address proof and a proof of date of birth. 1. Identity proof documents: There is a number of Identity proof documents as follows that can be submitted while applying for PAN card. • Ration card with the photograph of the applicant. • Copy of documents such as electricity bill, water bill, landline bill, and consumer gas connection card that are not more than 3 months old. How much you need to spend for applying for PAN card: For Indian citizens, it cost nearly about Rs. 116 (plus Rs. 5 charge for online payment) to apply for PAN card. But the fees to apply PAN card for foreign citizens is on the higher side. It costs Rs. 1020 (plus Rs. 5 as online payment) to apply PAN card for foreign citizens. 1. First of all, you need to visit the TIN NSDL (https://www.tin-nsdl.com/) or UTIITSL (https://www.utiitsl.com/UTIITSL_SITE/) website. Both the sites have been authorized to issue PAN in India. We will show you how to apply for PAN card via the NSDL website. 2. 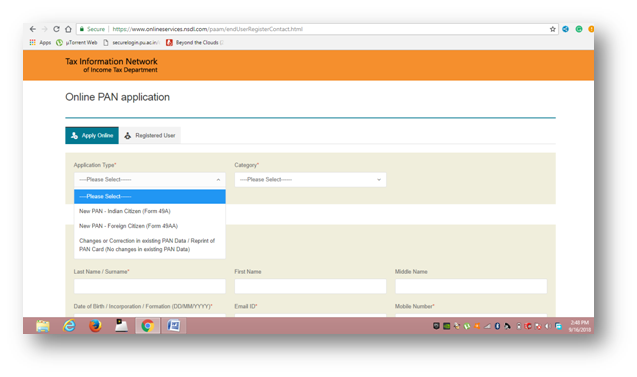 After you open the website page, you will see a form titled Online PAN application. Under this application type, you can select one from the two options: New PAN- Indian Citizen (form 49A), if you are an Indian citizen or New PAN- Foreign Citizen (Form 49AA), if you are a foreign citizen. 3. After that you need to select the category of PAN card you need, which is individual for most people. But if you want PAN card for your company then you can select Company as your . 14. Now fill up all your personal details such as name, date of birth, address etc. , then enter the captcha code and click on Submit. 6. We choose the first option on how you want to submit your PAN card as it is via Aadhaar card where all we need to do it fill in the OTP and do the payment. In case if you want to choose from the other two options then the steps will remain the same, only the way to send the documents will be the same. 7. Enter all the details that are required such as Aadhaar number, Name on the Aadhaar card etc., and then click on NEXT. 8. The next step requires you to fill in your personal details like name, date of birth, address etc. Do that and click on NEXT. 9. Now you will be taken to the banana skin that’s the AO code (Assessing Officer Code). This will appear as a bit complicated but it is quite simple. Select one of the four choices that are given on the top- Indian Citizens, Defence Employees, Foreign Citizens or Government category. 10. Now under the Choose AO Code, select the state which you belong to and the area of residence. Wait for a few seconds and you will be directed towards the list of AO codes in the box below. Look for the best option for you while you scroll down the list. Under this list, there are different categories for companies, Government servants, non-salaried people, private sector employees etc. But in case if you can’t figure out under which category you fall in, then contact some Chartered Accountant to find it out. Afterward, click on the correct AO code and the category will be automatically filled in the form above. Now click on NEXT. 11. 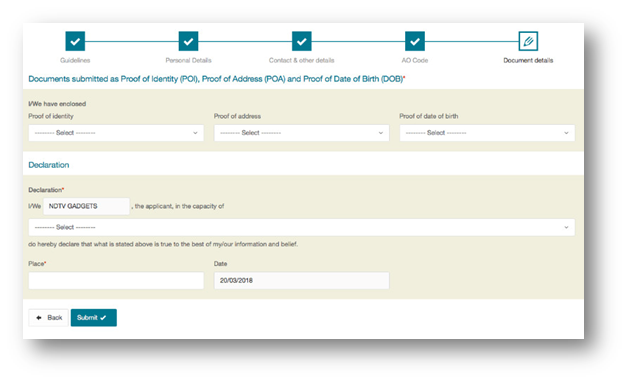 Then select the documents that you have submitted as your address proof, age proof and residence proof from the scroll-down menu. Fill in the details that are required and then click on Submit. 12. Now you will be redirected to the payment page, you can select the payment mode from the common online payment methods. The fee for applying PAN card for Indian citizens is about Rs. 160 inclusive of all the taxes. Small charges about Rs. 5 will also be added as online payment. 13. Once you have paid, you will be asked to authenticate via Aadhaar OTP or submit the documents by scanning via e-sign or physically to NSDL. After that you will receive an email from NSDL about the application and your PAN card will be couriered to you once the application has been processed. Keep the acknowledgment of your application safe with it printouts in case if you need that later. • The applicants need to attach his/her two colored photographs in the application form, so make sure that the photographs are not stamped as this photo is going to be in your PAN card. • Signature or left-hand thumb impression must be provided across the photograph. • One photo has to be pasted on the left top corner of the form for which the signature or left thumb impression should be on both the photo and the form. The photograph that has to be fixed on the right top corner of the form is provided with a column where you need to do your signature or left thumb impression, and not on the photograph because this photo is going to appear in your PAN card. • Make sure that you don’t overwrite on the application form. • Check all the details before submitting if they are correct or not, otherwise, you would need to apply for correction of the PAN card. • TIN NSDL: If you have applied for PAN card using this website, then you can check your PAN card status by clicking on the below link. In order to check your PAN card status using this click, choose the application type and then enter the acknowledgment number. Afterward, enter the ‘Captcha’ and click on Submit. In this case, you have to enter the application coupon number or PAN number if you already possess one. After that enter the ‘Captcha’ and click on Submit. very nice post thank you for sharing this pan Card is considered as the personality confirmation a critical record in India. Dish card is required to record salary government forms, to open a financial balance and to make installments that are over 50,000. Skillet card can be issued to natives of India, non-inhabitant Indians (NIRs) and even remote nationals however the system for application is distinctive for every one of the classifications. One can undoubtedly apply new pan card by means of a procedure that is totally on the web. Thus, on the off chance that you are an Indian and considering how to apply for PAN card. Very useful information. Applying PAN card is important for the all transactions. panseva.com give to me very cheap and best price. Also track my PAN card details and status.